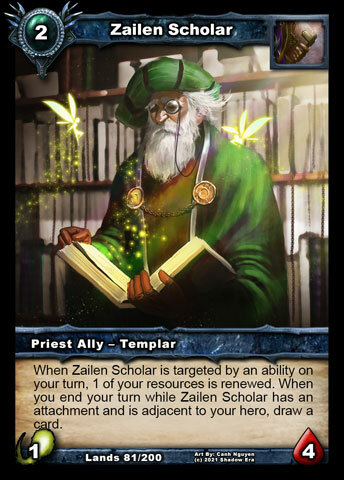 I just recognized in several games when Zailen Scholar enters into play in later turn (not sure) his ability of getting extra card is not activated always, however both my hero and Zailen Scholar has attachment. Please check! Zailen Scholar + Strength of Conv. Scholar needs to be next to your hero in order to draw a card. If there is another ally between hero and Scholar, then Scholar won't draw you a card. If you have 2 or more Scholars, and all of them have attachments, then you will draw only one card from the Scholar next to your hero. 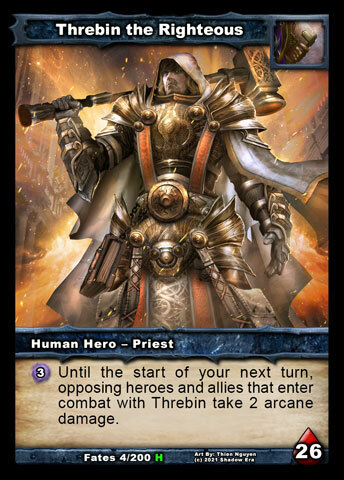 ^ Yes, as Veles said, Scholar was nerfed a couple of updates back to only draw you a card while it is adjacent to your hero and has an attacment. So only a Scholar next to your hero will do anything with that effect. Ok thanks that explains. Then this card became not so useful as his ability for card drawing is not reliable rather stochastic. Need to think on something else.